It can feel pretty uncomfortable when a mentee bursts into tears or blows their top. This wasn’t what you thought you signed up for, as a mentor! However, a mentoring relationship is a human relationship and emotions will play a part whether that relationship is formal or casual, personal or career-focused. An emotional reaction may be triggered by the subject of a mentoring conversation, or may explode due to factors about which you have no understanding. The danger is that mishandling emotions can damage the trust that is so vital to a good mentoring relationship. However, when handled properly, the release of emotion can lead you and your mentee to a new level of understanding, and help your mentee to face up to roadblocks that may be limiting his or her potential. We share some techniques for managing emotional outpourings in a way that will be positive for the relationship and for your mentee’s development. Understand that emotions like fear, rage or sorrow can be roadblocks preventing your mentee from moving forward. Rather than judging your mentee for their apparent lack of emotional control, see this as a chance to hold an amazing conversation that may be life changing for your mentee – and maybe even for you. If you are in a cross-gender mentoring relationship be cognizant that there are genuine differences in emotional responses, influenced by both biological and cultural factors. In her book It’s It’s Always Personal, Anne Kreamer explains that women tend to be more emotionally constrained at work, because anger might be seen as “bitchiness”. So suppressed anger and frustration may be released as tears. Biology plays a part as well. Women have six times as much prolactin as men, a hormone related to crying. 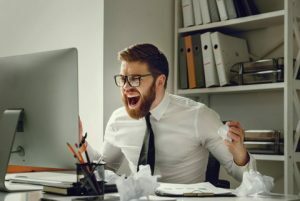 In researching her book, Kreamer found that two thirds of men believe displaying anger is an effective management tool. Unsurprisingly, men are more likely to allow anger to erupt than to stew over it. Emotion often begets emotion. An angry outburst can trigger feelings of intimidation or a need to “give them a taste of their own medicine”. Pause and take stock of your own feelings before you rush to deal with your mentee’s. If emotions are spiralling out of control, it might be time to help your mentee move from a reactive to a thinking state. If the situation feels hopelessly out of control, then you can offer to reschedule. But this should be a last resort. It is much better to allow time to recoup than for your mentee to feel that their emotion was somehow wrong. Clinical psychologist Dr. Albert J Bernstein explained one technique for redirecting the conversation in his book Dinosaur Brains: Dealing with Impossible People at Work. The trick, he says, is to stop escalating emotion with two simple lines. “Please speak more slowly. I’d like to help.” This statement breaks the pattern in the emotional person’s head. Slow means calm, and calm makes it easier to access your thinking brain. “What would you like me to do?” This simple question starts to move the emotional person from the primitive, emotional part of their brain into the thinking/rational part. Regardless of what is causing the emotion, you are much better to offer questions than answers. As Bernstein says, “Explaining is always a disguised form of fighting back”. Asking questions is far more likely to calm your mentee down and lead the conversation onto firmer ground. Curiosity can also lead you both to better understanding. It is quite possible your mentee doesn’t know what is driving their behaviour. Your questions will help them to self-discovery. This is a chance to hold an amazing conversation that could hone your mentoring skills and unlock your mentee’s potential.